I never consider a room DONE. There is always some detail that still needs to be tweaked. 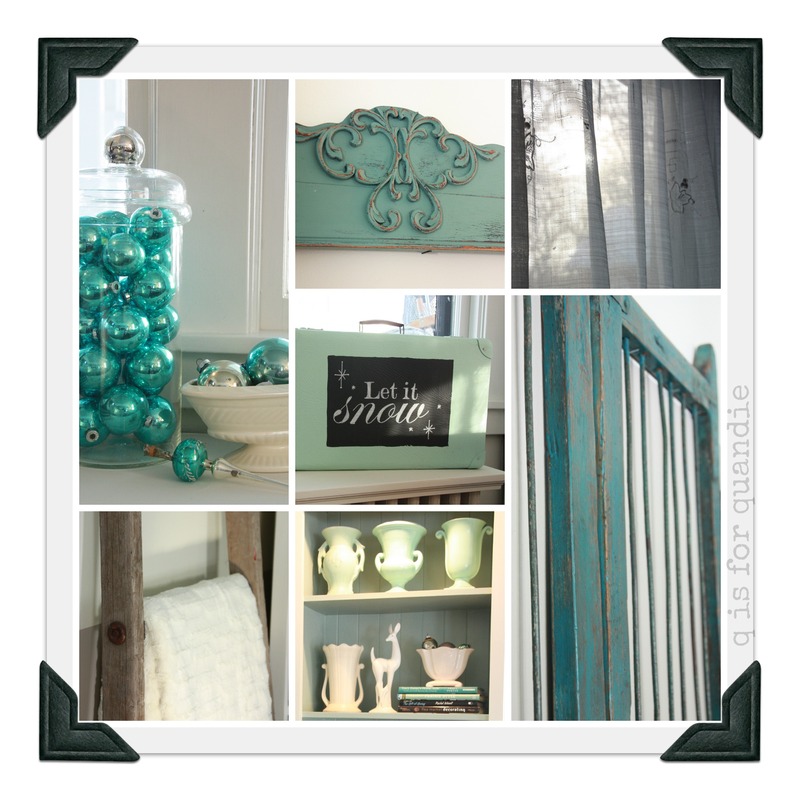 Rooms are continually evolving. And in the end, I’m never quite completely happy with them. The perfectionist in me has a problem with that. So, that being said … I’ve ‘finished’ project ‘domino effect’ … sort of. But not quite. As you can see, my living room is small. This is a 1904 farmhouse. There is nothing extravagant about my house. These windows face the street (and north). I have an enclosed porch out front and that is what you are seeing through the windows. If I do a complete 180 from this spot, I see this view. The wall and trim paint is finished in both rooms (thanks to a little help from Lacqui and nnK). 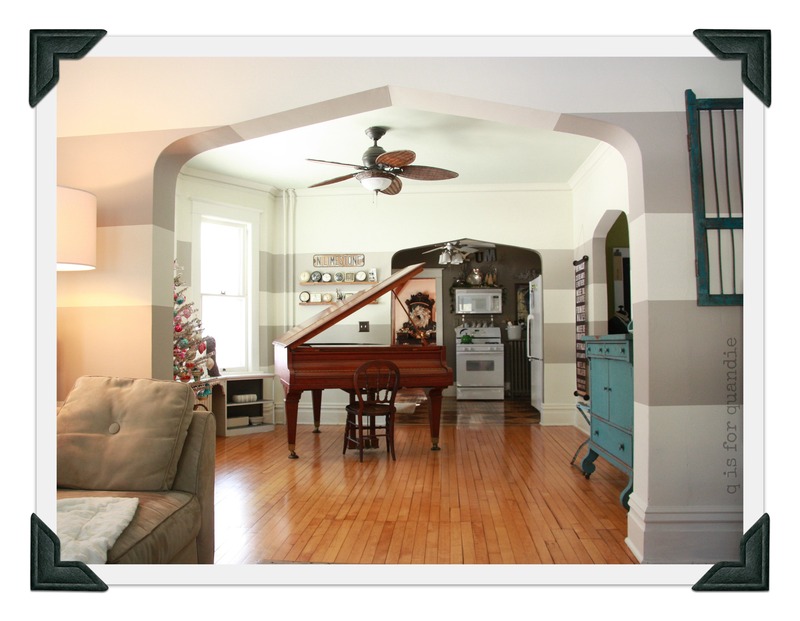 As you can see, I carried the same stripes from the piano room through the archway into the living room. and chair for now. I was worried they would look dingy and too beige, but they actually just continue to look neutral. They still match each other, and down the road I’d like to replace one or the other. But they are really super comfy and aside from being filthy, still in pretty good shape so I will get them professionally cleaned and call it good for now. My big splurge for this re-do is the new coffee table. I struggled with this purchase. Part of me felt like I should get creative, and find something fabulous to re-purpose as a coffee table on my own. But, I’ve always admired these factory carts, and when I saw this one on craigslist I knew I had to have it. I’ve mentioned that I’m usually a complete cheapskate, but sometimes I’m not afraid to spend a little more on something that I absolutely must have. I sent my husband to Minneapolis to pick this up from Josh and Heather of Ferrous Furnishings. You can see some more of their very cool stuff here: https://www.facebook.com/FerrousFurnishingsMinneapolis (check out the amazing bar cart!). I was a little nervous because I couldn’t go with him, and I was entrusting him with the final purchase decision. But I had exchanged several emails with Josh, and he answered all of my questions and was super nice to boot. 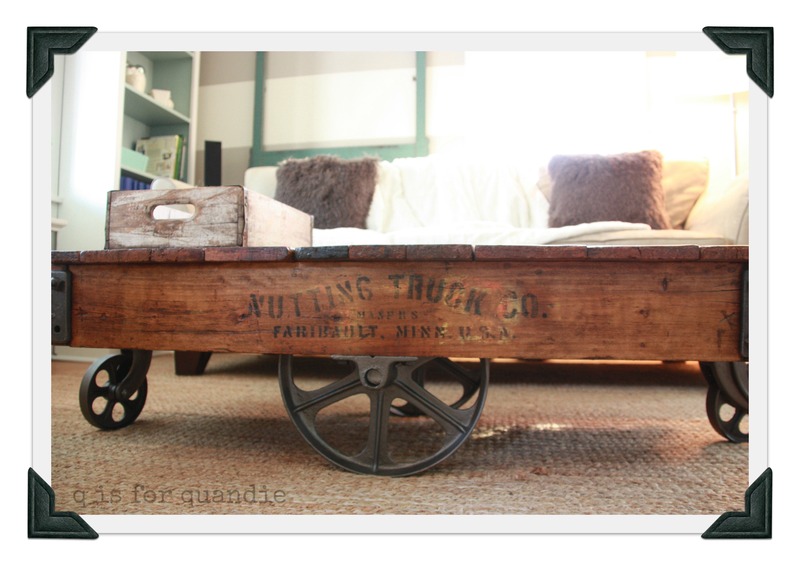 The hubby thought the cart was fab on sight and brought it home and it’s perfect for our living room. Now, you may have noticed a couple of things. First, I haven’t added much to the top of the factory cart aside from a wooden box full of my fav magazines, Jeanne d’Arc Living. I’m struggling with what to place on it that won’t block my view of the TV (hey, a girl has to be practical!). Do I need something more, or should I just leave it? You’ll also notice that I haven’t shown you the TV, here it is in it’s own little corner. Next, once again I am in a quandary about the window treatments. I’ll leave the three front windows bare, but I must have something on the window behind the sofa. Unfortunately the neighbor’s living room window has a bird’s eye view straight in through that window. For now I have used a vintage linen tablecloth hung from a simple tension rod. It’s lovely when the sunlight is shining in through it, but is it too delicate for this room? Finally, I started out with my grandfather’s watercolors on the wall above the sofa. They may look OK in the pictures, but I felt they were too small. There was a lot of empty space above them. So, I pulled out this old mirror frame, quickly painted it in my new favorite color, Kitchen Scale, and threw it up on the wall. It’s the perfect size, but now I need to come up with something to put inside it. A reproduction vintage map of Rome? A collage of ironstone plates? Some vintage family photos? So many possibilities … what do you think? See what I mean? I’m never really done. “Never done” rings true here. I made seat covers for two chairs in my foyer. I wasn’t crazy about them from the get go, and then I found two ottomans to put with the chairs, so I am recovering those and the seat cushions in the same fabric. Now for your living room. 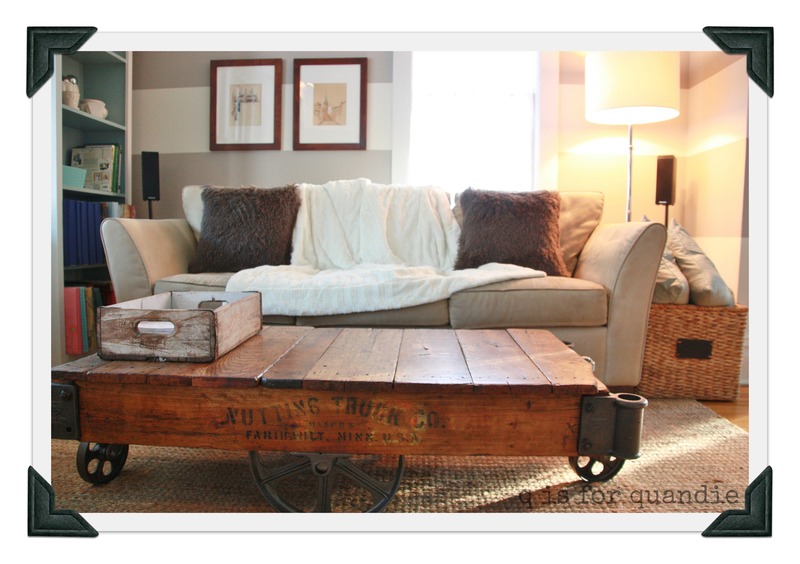 First off, great decision on the coffee table cart. I occasionally splurge on one thing in the room when I know it is going to really pay off. As for the wall behind the sofa. The framed watercolors looked fine but so does the newly painted frame. I like the idea of plates inside the frame. your other ideas are good too. Guess it’s back to “try & see.” All in all, everything looks great. I forgot to mention the window behind the sofa. 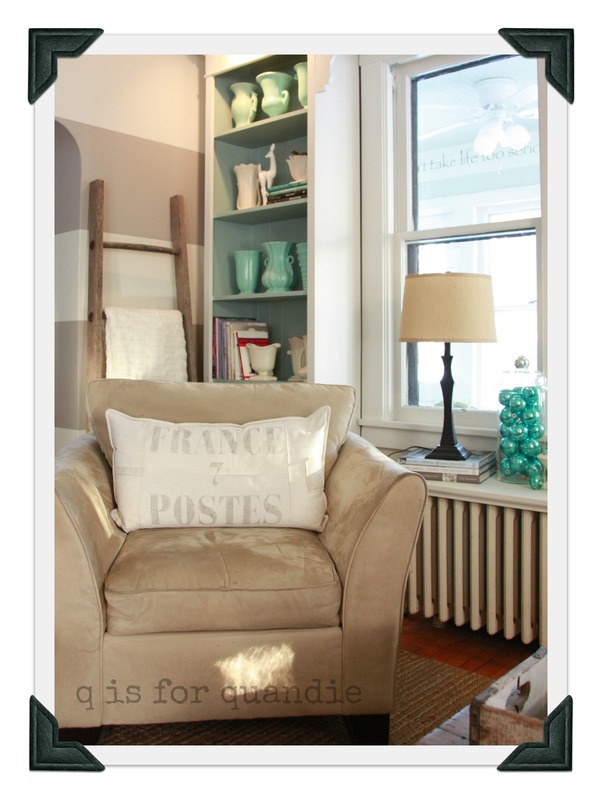 What about a jute type shade that would pick up the colors of your industrial cart and the basket beside the couch? Sometimes you can find table runners in that material that could be on swing out 1/2 rods so you have them open in the daytime and then just swing them shut at night. I should finish my thoughts before I hit post. How about burlap? No sewing required. I painted a strip on my burlap curtains. 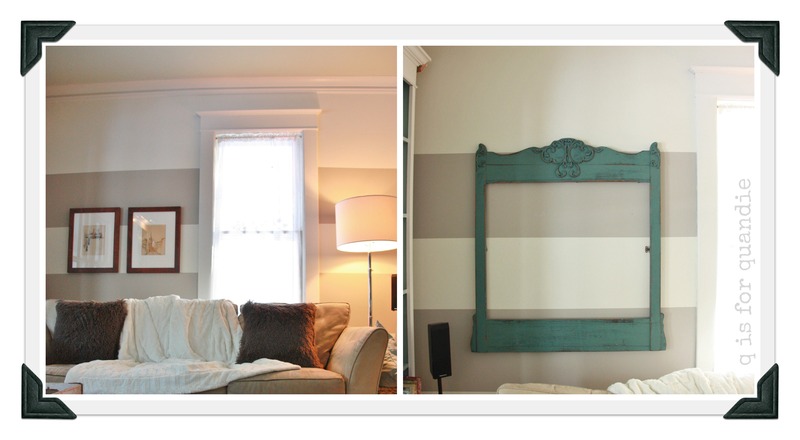 You could just continue the stripe from your wall right across your curtains. Use a creamy white burlap and you won’t shut out much light either. I folded the burlap forward at the top creating the look of a valance. Then I pulled a few strands giving it a little fringe finish. I have been thinking of burlap! I might give that a try. Thanks for the suggestion! I think “never really done” is appropriate for anyone with a passion for home decor…Your living room looks lovely – I especially LOVE that cart!! I have been wanting one for a long time now, but sadly they are out of my budget!! Congrats on finding one! the space look fresh. Don’t agree with Candace about TV cabinets. I think she made a blanket statement. I think they still have a place I just prefer the ones that are antique or vintage pieces refurnished with paint finishes. Every room needs a power piece that helps to create drama or impact a large piece that houses the tv. Let’s face it there is nothing pretty about a tv. Of course they are part of our lives today but they seems to fit a modern/ contemporary space fine the same asethic. Not so forcthosewith traditional, vintage or country decormaybe not so much. Sorry about the soapbox! Just my two cents with your talent I would love too see what you could do to reinvent one of those old tv cabinets. That could be a business in and of itself. 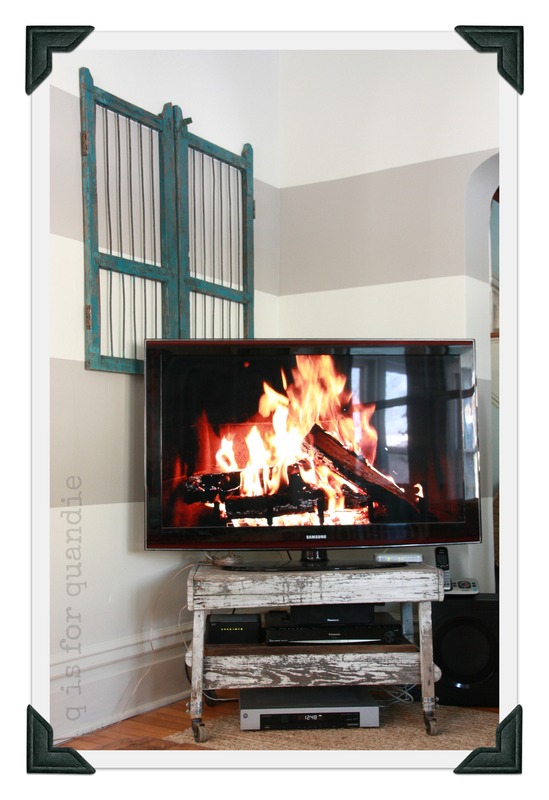 Fireplace on the tv is clever though give you that. You are right, Candace did make a blanket statement. Very true that it won’t apply to everyone. 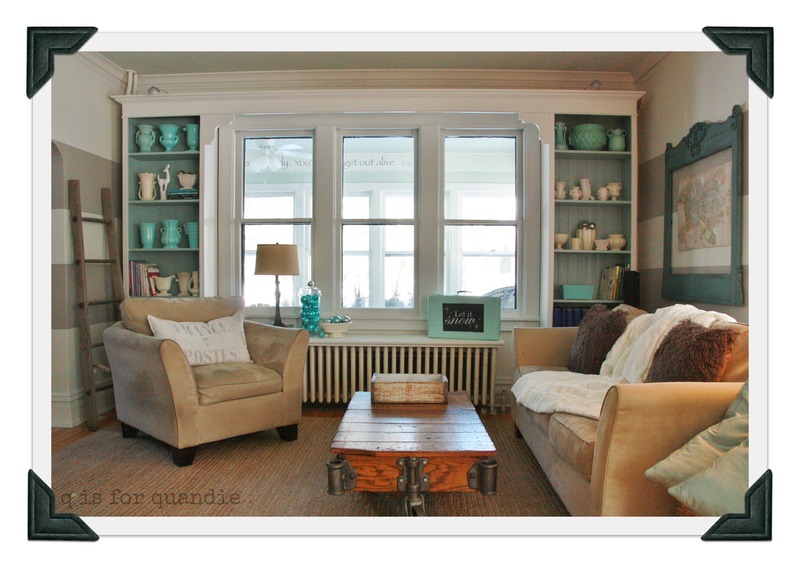 I would love to reinvent old tv cabinets because there are tons of them for sale on craigslist! But, part of the problem is that they were sized for the old TV’s. The big new widescreens just don’t fit anymore, and that is what I have. I struggle because my TV is located in a corner. Not very conducive to using a cabinet (although I did have a corner cabinet when I had a smaller TV). I also like the idea of mounting your TV on the wall, but with my plaster and lath walls, that doesn’t seem like a good bet either. Finally, the real story is that 99% of the time spent in my living room is spent watching TV, so I just go with it.